Sometimes a simple Google search is not enough. For sales professionals, business intelligence is a critical factor in finding and qualifying sales prospects, so that they can build the best outreach plan. For executive recruiters, business intelligence can also help target high-profile candidates by screening backgrounds that match their opportunities. Without the right tools, such searches can be time-intensive and highly manual. Sometimes a combination of tools can be even more valuable. S&P Capital IQ + SNL Financial (S&P Capital IQ), a leading source for financial data, maintains extensive business intelligence that can empower sales representatives and executive recruiters. As so many of these professionals already use Salesforce to manage their leads and relationships, S&P Capital IQ recognized the synergy between its data and the Salesforce platform. Their vision was to integrate the database directly into the Salesforce user experience so users could easily capitalize on its powerful screening capabilities in context, and store a robust profile for each qualified prospect in Salesforce for future CRM activity. The solution provides users with actionable data when they need it most, and drives complete customer intelligence throughout the sales process, from search through engagement. In order to achieve its goal, S&P Capital IQ needed to build a custom app that could be delivered to customers via the Salesforce AppExchange. Moreover, S&P Capital IQ wanted to do so in time for Dreamforce—Salesforce’s annual conference in October 2014—which was five weeks away. S&P Capital IQ engaged cloud-technology experts Cervello to help it design, develop, and deliver the new application within an ambitious timeline. In order to optimize its initial investment and meet the launch timeline, the Cervello development team chose the Heroku platform to run the S&P Capital IQ app. The team appreciated the speed and simplicity that came with using Heroku, along with the pay-as-you-go model, which allowed them to focus squarely on building the S&P Capital IQ app. Another advantage of using Heroku is that it allows S&P Capital IQ greater ease in scaling its application—new features and functionality—in the future. The development team used Java, Node.js, and Ruby to build the app, and chose the Heroku Postgres database because it would support fast processing of the large S&P Capital IQ data set. Cervello used PostgreSQL Studio to access the database through an easy web-based UI. The team rounded out its implementation with a number of Heroku Add-ons including: Librato and New Relic APM for performance monitoring, Papertrail for log management, Heroku Scheduler to run scheduled tasks, PointDNS for DNS management, and SendGrid for email delivery. S&P Capital IQ’s Salesforce Visualforce pages leverage web services to retrieve information acting as the view in an MVC framework. Security was also a top concern for S&P Capital IQ. During development, the team also managed the rigorous security review process, working closely with Salesforce and Heroku to ensure the app met strict security standards. 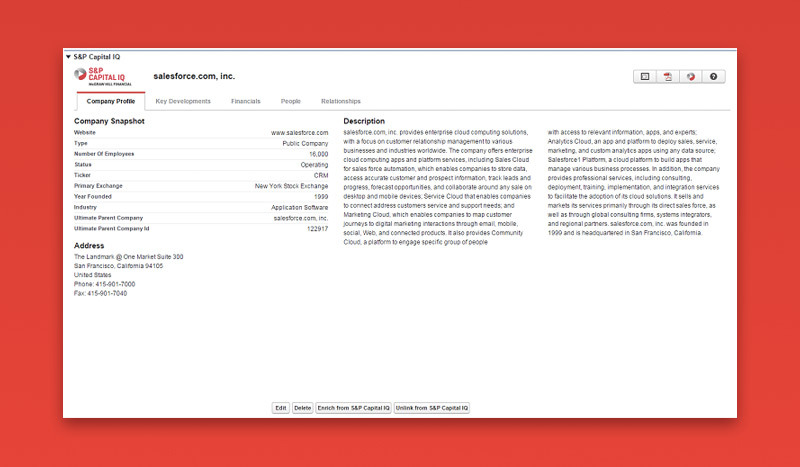 After installing S&P Capital IQ for Salesforce, users are ready to conduct a search. 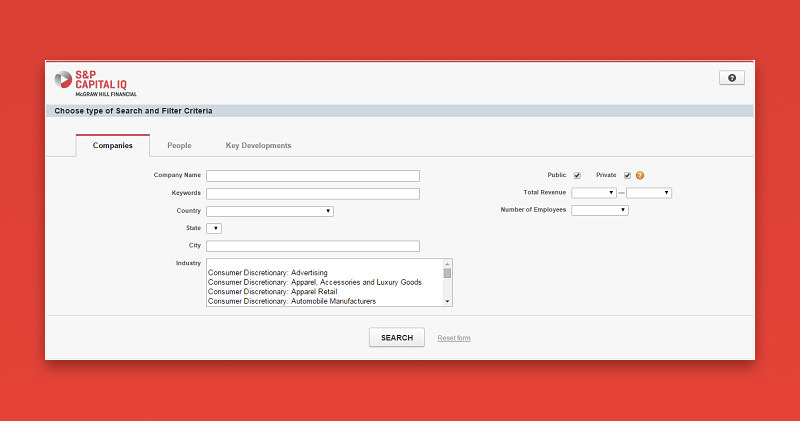 Sales representatives may set search criteria such as geography, company size, company revenue, and industry verticals. The app screens all the records in a database and produces a set of companies that match the criteria. The user clicks on a company to view its profile, key developments, financials, and executives or key decision makers, and competitors. The user then simply checks a box and the records are uploaded directly into the Salesforce instance. Recruiters may set similar criteria to search for executives in their database. In just a click or two, the user can import the executives who match their criteria along with their bios directly into Salesforce Contacts. With S&P Capital IQ for Salesforce, business intelligence can help Salesforce users make smart decisions. Are you building an app that integrates with Salesforce? S&P Capital IQ appreciates the speed, simplicity and scalability that comes with running their integrated app on Heroku. For more information, contact Heroku today. S&P Capital IQ and SNL Financial, a business unit of McGraw Hill Financial, is a leading provider of financial and industry data, research, news and analytics to investment professionals, government agencies, corporations, and universities worldwide. The newly combined firm integrates news, comprehensive market and sector-specific data and analytics into a variety of tools to help track performance, generate alpha, identify investment ideas, understand competitive and industry dynamics, perform valuation and assess credit risk. For more information, visit spcapitaliq.com or snl.com. Cervello Inc. is a leading professional services and solutions provider focused on helping companies solve complex data challenges, improve business analytics, and optimize business performance. The company focuses on transformative cloud-based technologies in enterprise performance management, data management, and business intelligence and customer relationship management. For more information, visit mycervello.com.